Jane Peters Estes has been a living historian and active member of various Delaware Valley region historical organizations for almost 30 years. 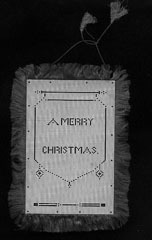 She shared some of her expertise with members of OBCWRT on December 8th when she presented “Christmas Past,” a delightful overview of the origins of many of our Christmas traditions, ranging from the hanging of stockings to trimming the tree. 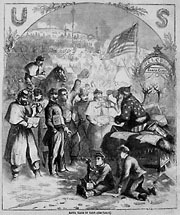 Jane’s presentation particularly highlighted Christmas customs of the Civil War era and offered many insights, some of them surprising. The program was an early yuletide gift to all who attended. Jane has had articles published in Civil War Lady Magazine, Citizen’s Companion Magazine, Philadelphia Bride Magazine, and People Magazine. 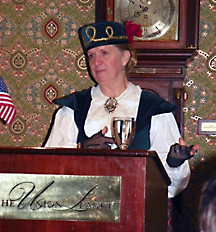 Jane’s many programs and presentations include: Civil War Nurses, Fashions of the 1860s, Grave Matters (Victorian Mourning Customs), Wedding Customs and Traditions, Women’s Lifestyles of the 1860’s, Vivandieres, Pets of the Past, and The Battle of Gettysburg: Where Were the Women?